The USO brought heavy-metal band Disturbed to Creech Air Force Base, Nevada, to meet the airmen behind the Remotely Piloted Aircraft (RPA) mission and perform the base’s first-ever concert on Oct. 23. The band was welcomed to Creech by base leaders and then walked through a mission brief, during which the band learned how the roles RPA airmen play in executing the persistent attack and reconnaissance mission. Each band member also had the opportunity to fly training missions with the 432nd Operations Support Squadron’s MQ-9 Reaper flight simulator, both as sensor operators and pilots. With simulator experience in the books, Disturbed met with airmen for lunch and a meet-and-greet event where airmen took photos with the band and brought in personal items for signing. Dan Donegan, guitarist for the band Disturbed, receives a bite from a military working dog during a demonstration at Nellis Air Force Base, Nevada, October 24. Members of the band Disturbed meet Air Force families during a tour of Nellis Air Force Base, Nevada, October 24. Members of the band Disturbed tour the 57th Wing Eagle Aircraft Maintenance Unit at Nellis Air Force Base, Nevada, October 24. Members of the band Disturbed take a photo with an Airman during a tour of Nellis Air Force Base, Nevada, October 24. 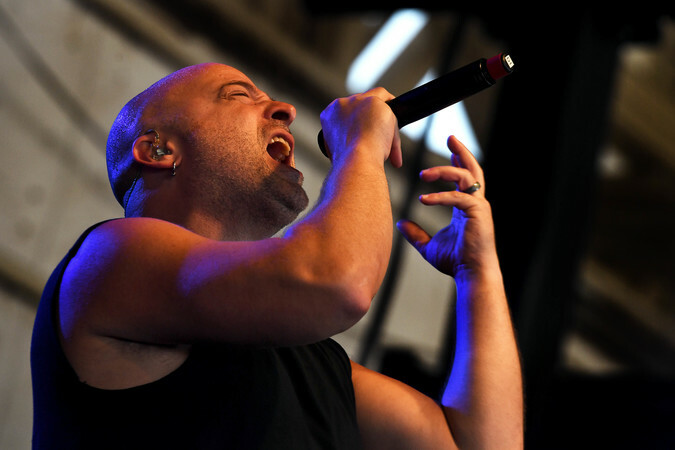 David Draiman, Disturbed lead vocalist, performs for Creech Air Force Base airmen Oct. 23. Approximately 700 airmen, veterans, family and members of team Creech attended. The next day, the band visited nearby Nellis Air Force Base, participating in a military working dog demonstration and getting an up-close look at military aircraft on base. After visiting various units, Disturbed performed a second show for airmen and their families.